Manchester United's caretaker boss Ole Gunnar Solskjaer has reportedly held discussions with Juan Mata in an attempt to convince him to stay at the club. The Spaniard's contract with United expires at the end of the campaign and he is currently free to discuss terms over a Bosman move with overseas clubs. As such, the 30-year-old has already been linked with a return to Spain with Valencia keen on re-signing him but Metro reports that Solskjaer is eager for the midfielder to stay put. 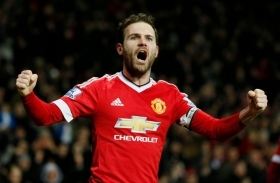 The report adds that Mata's father and representative is scheduled to meet the United hierarchy later in the week with the playmaker open to the idea of remaining at the club. Mata has started three of the six matches where Ole has been at the helm, though he has completed 90 minutes in any of those. The ex-Chelsea man has contributed 44 goals in over 200 appearances since joining them in January 2014.